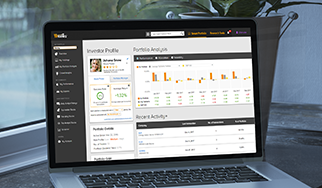 Our new screener allows users to find investment inspiration fast. The best part about the screener, apart from the fact that (as you will see) it is very easy to use, is that alongside standard filters like market cap, sector, yield etc. 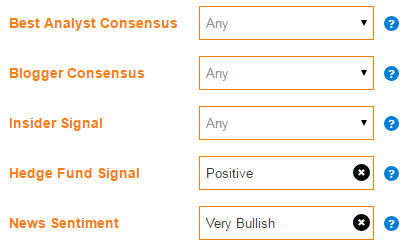 users can also screen for the analyst consensus rating. You can find stocks that only have an analyst consensus rating of strong buy, or if you prefer, strong sell. What happens if we use the analyst consensus filter to find some strong buy stocks? 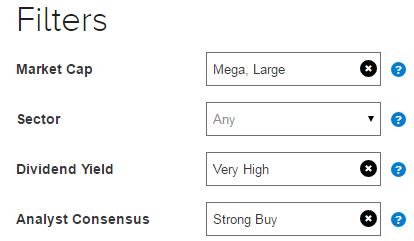 We set just four filters- market cap (mega, large), sector (all), yield (very high) and analyst consensus (strong buy). From the 10 or so stock results, 5 had only buy analyst recommendations- no holds, no sells. Out of these 5 we narrowed it down by looking at the upside potential in the average analyst price target. The results: Blackstone Group (BX), and crude oil/ gas company Enterprise Products (EPD). 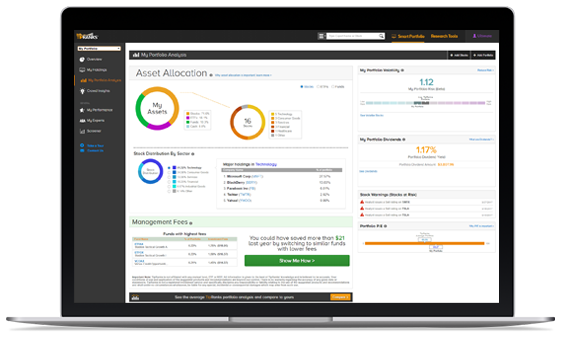 Private equity and financial services Blackstone has, for example, at the time of writing, an average analyst price target of $35 which translates into an impressive 23% upside from current share price. We can take a closer look at the various stock signals by expanding BX’s results box. As well as a chart showing how the stock has moved over time, note how the blogger consensus, news sentiment and hedge fund and insider signals are all included. The screener also gives us the option of setting five further filters to prioritize more advanced metrics such as news sentiment or hedge fund signal. Filtering for news is interesting because the sentiment score can move faster than the analyst consensus on a stock so it allows you to stay ahead of the market. If we adjust the filters to prioritize mega cap companies with very bullish news sentiment and positive hedge fund signal (i.e. in the last quarter hedge funds have substantially increased holdings in that company), we can pull up stocks like global pharma company Pfizer. PFE has, at the time of writing, a very strong news sentiment and a moderate buy analyst consensus rating. Have a question about the TipRanks Screener?